A screen from YouTube video by ΕΡΤ Α.Ε. 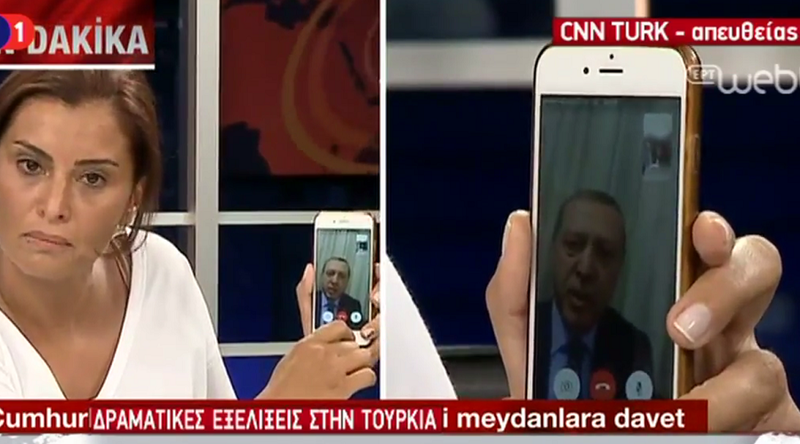 Turkey's president, Recep Tayyip Erdogan, appeared live on CNN Turk via FaceTime on the presenter’s cell phone, saying the ongoing military coup in the country “will be overcome” and calling on people to protest. Erdogan has urged the nation to come out to the "squares and airports," saying that no force can stand the power of the people. Reassuring the audience that he still is the president of Turkey and its commander-in-chief, Erdogan has described the situation as an attempted uprising by a minority in the army. According to Reuters, the coup attempt occurred when Erdogan was on vacation outside the country. In his TV appearance, the president said he was returning to the Turkish capital of Ankara. The authorities would take all "necessary steps," he said, adding that he didn't believe the coup backers would succeed. There have been unconfirmed reports that Erdogan’s plane has been diverted inside the country, but airports in the Turkish capital had already been closed by the military with all flights diverted. NBC News reported that Erdogan's aircraft has been denied permission to land in Istanbul, citing a source in the US military. Senior US military source tells NBC News that Erdogan, refused landing rights in Istanbul, is reported to be seeking asylum in Germany. The latest report claims that the Turkish president is seeking asylum in Germany. While the whereabouts of the Turkish president are still unknown, there have been unconfirmed reports that his plane has been flying across Europe. It has been claimed that Erdogan has been declined landing rights in Germany and Western media sources say he might be now heading for London. Prime Minister Binali Yildirim has reportedly refused to call the ongoing events a coup, saying that "for the moment... this is an uprising," Hurriyet Daily News reported. Speaking to broadcaster NTV, the PM said that those behind it will be punished "the hardest way." Speaking live on local television, Turkish Deputy Prime Minister Numan Kurtulmus said Erdogan's AK Party was still in charge of the government, Reuters reported. Justice Minister Bekir Bozdag has claimed that the people behind the coup are members of the movement that is loyal to US-based cleric Fethullah Gulen, according to Reuters. President Erdogan and his supporters within the government have described the military behind the coup as a small faction. They would be defeated, the officials said, with one of the senior officials saying it might take some 24 hours to restore order within the country, Reuters reported. The exiled preacher, who has resided in the US since 1999, was a firm ally of Erdogan as the then-president-to-be rose through Turkish politics. The two then fell out, however, with Gulen now facing a life sentence in Turkey for orchestrating an earlier coup.